I sure have had a long year and need support once again. Going into the fall 2016 I will have had nearly 20 rounds of chemo. I have now tried 5 different combinations of chemo and maintenance drugs. 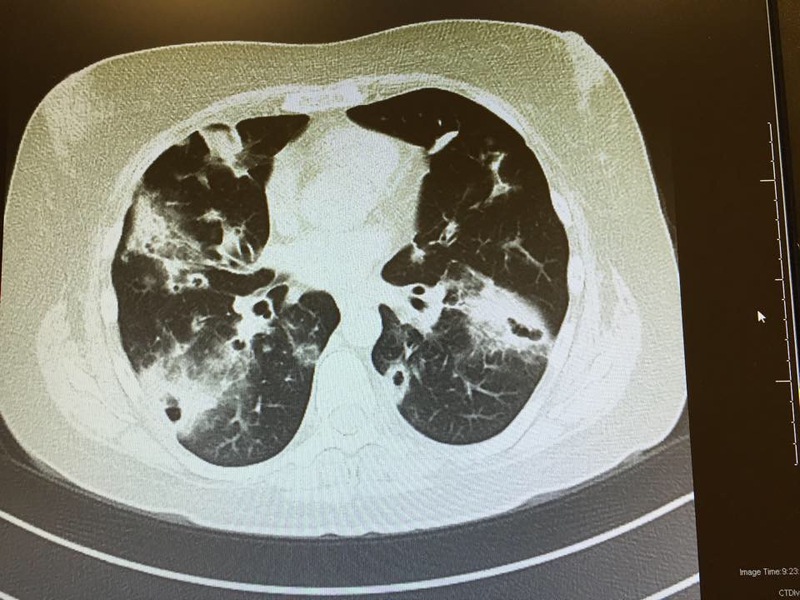 As I mentioned before, what I have is not curable as this sub type of Lung Cancer is so rare. Back in February 2016 we were able to reduce quite a bit of the cancer, but it just grows back there are no targeted therapies made yet. Out of the 60 or so lung cancer genes, only 10 have therapies developed for them. So- where am I at now? I am looking to go on Cobra with my insurance company and pay out of pocket for insurance coverage and daily life. Cobra for me is $678 a month and anything above that amount that comes in would help with food or daily expenses. Yes for a while I have disability coverage- and that subsidizes the rest. Please consider a monthly support of the occasional donation to my go fund me which is greatly appreciated. Thank you so much. As it stands now my next therapy starts August 12th. This is Cisplatin and Alimta. This is a 7 hour day at the Cancer center. Cisplatin metabolizes through the kidneys and is very tough on them so please pray for me during these treatments every 3 weeks. The nausea is supposed to last up to 6-7 days. My next scan will be in late October. Honestly I don't know what's next. It could be another physical biopsy after that of remaining tumors. I've already had one last year as well as a new cutting edge liquid biopsy which is a blood draw that cross matches your blood with existing therapies and - well no surprise there- my results came back with no matches. Thank you again for all prayers and love that you've sent. This has been a long year. Right now we are praying for full healing- like I never had cancer. First off thank you for visiting my go fund me page, we will just have to get right down to the details. It was thought for most of this year that I had pneumonia. Unfortunately even in modern medicine there can be a misdiagnosis. For me this is the case. For those of you who do not know yet I was initially diagnosed with pneumonia. Then I went through 4 rounds of antibiotics that didn't work (due to the real underlying causes). With that we went through CT scans, MRI, PET scans and a bronchoscopy, and a lung biopsy where I experienced a right lung collapse. After the results came back from the biopsy, on 9/29/15, my mom and I were in the doctor’s office and received the word that I have been diagnosed with a rare form of non-smoking, non-genetic lung cancer. Because this type of slow growing cancer is often misdiagnosed for pneumonia it can grow undetected as it masks itself and tells your immune system nothing is wrong. This means when I found out about my lung cancer it was already in both lungs and considered stage IV- a devastating blow. So what now? Well I have had a chest port put in to receive chemo and to take blood as needed. I'm just letting everyone know because my life has been rapidly changing. Bronchioloalveolar Adenocarcinoma is the type of cancer diagnosis I have. This type that I have is sadly considered "not curable" but treatable and can become manageable to extend some longevity for me. So we are holding on in faith for good results. Obviously as with anyone who would receive a cancer diagnosis there are so many whys, but as of now, the focus on the horizon is getting these tumors to shrink down, acquire better breathing and try to return to a sense of normalcy. After chemo, I will still be on a maintenance plan, receiving Avastin every 3 weeks until the tumors start to grow again. Just letting you know I do have good health insurance, but will still be incurring some costs for treatment and after treatment. If you feel led to donate money to help me out that is so welcome, just like everyone else my health insurance deductible renews in January so all over again I will be incurring costs until I meet my deductible. I would also appreciate your thoughts and prayers as I go through chemo every 21 days through early February. Much Love to all of you. I'm grateful that you are my family and friends. All of the doctors are happy that I am in relatively good shape, have a positive attitude and that there is so far no other cancer in my body. This means I will just be fighting in my lungs and the treatment can be targeted there. I am fairly young to have this diagnosis so that also means I have a better chance of fighting this than an elderly or sickly person who might receives this diagnosis. All that said I'm trying to send you the message we have positive and high hopes for success and although it's not curable, we believe in miracles. 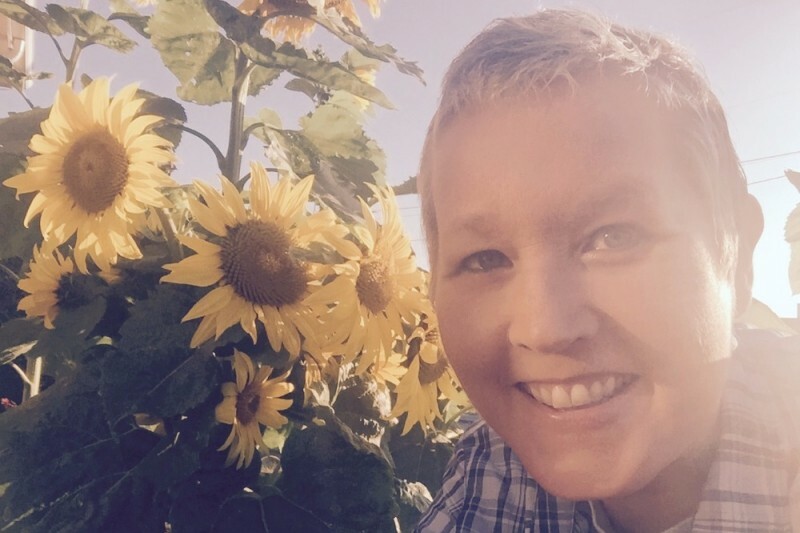 At this time we’ve made a family decision to deactivate Viki’s Go Fund Me campaign. What a journey it has been over the past 3.5 years, and what a Blessing your support has been for Viki to fall back on. It is with deepest gratitude we all say “Thank You” again from the Hedman Family. - Donald, Leona, Judy & Greg, Paul, Laura & Bryce, Haley & Mario and of course Chachi. At this time we’ve made a family decision to deactivate Viki’s Go Fund Me Campaign. What a Journey this has been over the past 3.5 years, and what a Blessing your support has been for Viki to fall back on. It is with deepest gratitude we all say “Thank You” again from the Hedman Family. Hi all, so much love and hugs to you. Thank you so much for your support during my illness. If you’ve read the previous updates you now know we are past lung cancer drugs and looking to whatever is beneficial. About 6 months of 2017 I was on Gemzar and Navelbine which are not for lung cancer but have overlapping positive impact for lung cancer. After 2 insurance denials time was passing so we had to get me into something else which turned out to be Irinotecan which is not a lung cancer drug but has some overlapping positive benefits for some patients. This also was supposed to help block some growth but it didn’t. Now we are back to starting Gemzar for approximately 12 or 13 treatments which might take time to mid summer 2018. As of end of March 2018 I will have had 50 chemo treatments along with hundreds of medical appointments since diagnosis in September of 2015. We are hoping that returning to Gemzar helps since it has been 6 months since I’ve been on it and the new growth I have may not have been treated by it. I will also most likely do another lung biopsy soon for the same reason. Perhaps the newer growth may have cells that can be treated by existing meds. 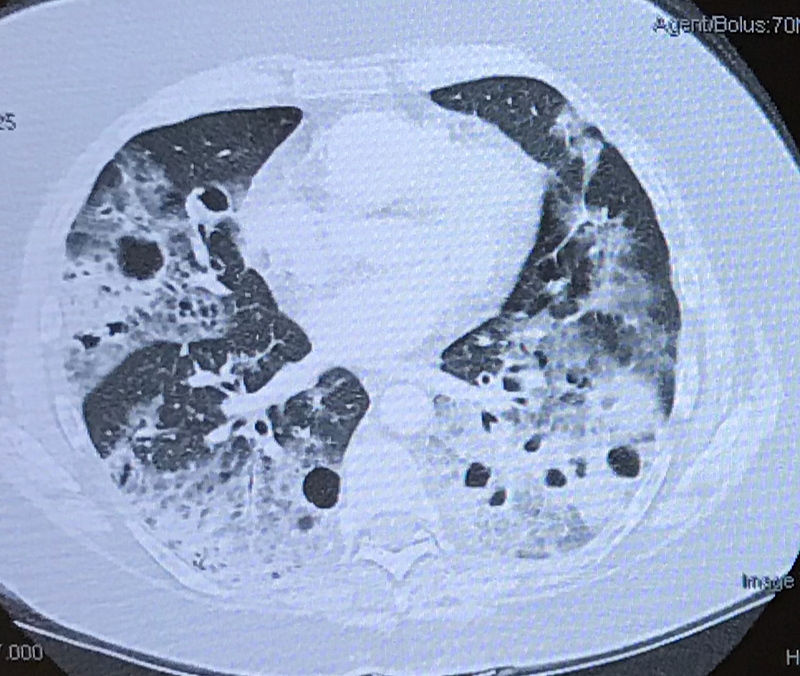 Here is a current screenshot from February 2018 showing a lot of cancer in the bottom of my two lung lobes now. So frustrating with all the coughing and it slows me down. Again I thank you for all your prayers, good thoughts and consideration for your donation to my go fund me account. 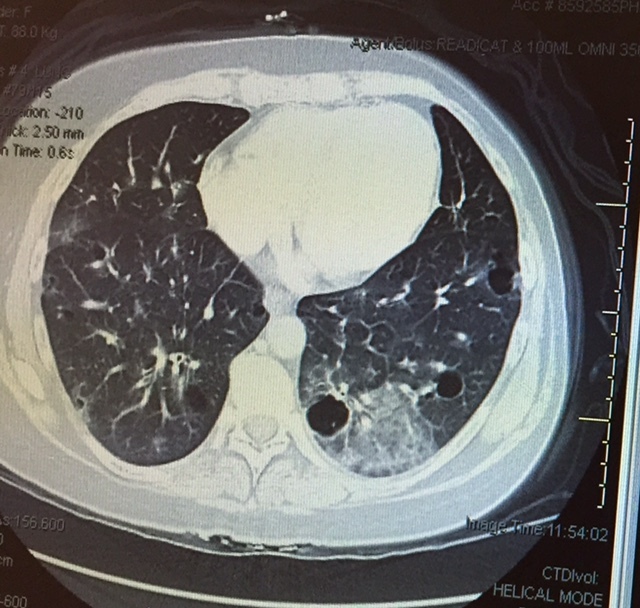 Pictured below: Viki's lungs in August 2015, Black spots are tumors with congestion all around them. You are in our family prayers as you do thru this difficult time.